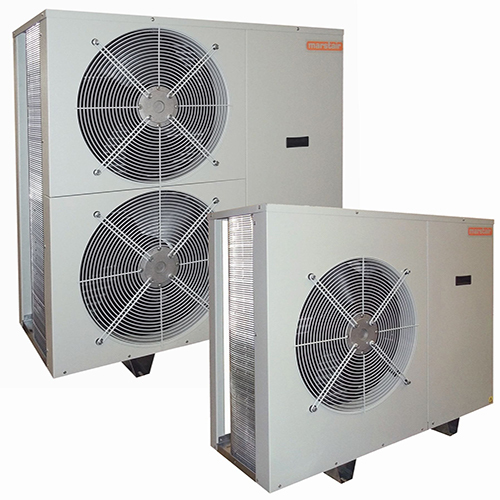 We distribute fully dressed condensing units MRC (+) and MRC (+) LT with medium and low temperature products suitable for cold room, retail display cabinet applications as well as air-conditioning condensing units suitable for air handling units and R22 refrigerant replacement units. This quiet, efficient and slim profile unit will operate free standing or wall mounted. All units are supplied with a nitrogen charge so the installer can select the appropriate refrigerant for the application. The Marstair range of medium temperature refrigeration condensing units are an effective cooling solution for food display cabinets and many other refrigeration applications designed specifically for outdoor use. The Marstair range of low temperature refrigeration condensing units for freezer temperature applications are available with the benefits of the MRC+ range.